Community card poker is a form of poker that uses shared cards, also called community and window cards. Each hand, the dealer deals the shared cards face up at the center of the table, and every player at the poker table use those same community cards. The rules of the poker variant dictate the precise number of shared cards. The dealer also deals a set of private cards to each player. The player can then use these private cards, also called hole cards, along with the shared cards to create a hand. Each variant has its own rules for forming hands. The full set of shared cards is called the board. Typically, the dealer deals them out side by side in a straight line. 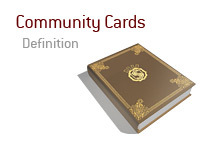 Some variants, however, require that the dealer to arrange the community cards in a particular pattern. Originating in the U.S. in the 1920s, the most popular community poker game in the world today is Texas Hold 'em. In the first phases, the dealer deals two private hole cards to each player, and then there is a betting round. In the second phase, the dealer deals three community cards to form the flop, and then there is a betting round. In the third phase, the dealer deals a fourth community card, called the turn, and then there is a betting round. In the fourth phase, the dealer deals a fifth community card, called the river, and then there is a final betting round. The fourth phase is followed by the showdown. Each player reveals his or her hand, and then the best hand possible is used for each player. The winner is determined, the pot allocated and then the round concludes. Omaha Hold 'em is another popular community poker game. A key difference between it and Texas Hold 'em is that in Omaha Hold 'em, the player must use two hole cards (out of four) and three shared cards (out of five).